Mark Redsky was born into the Anishnabe Nation in Kenora, Ontario. Mark discovered his artistic talents for stone carving in high school and has continued to work on his craft since 1995. He has also expressed himself artistically in the form of poetry and acting. Being Anishnabe, Mark draws upon his heritage and nature for inspiration in his work. Animals, inukshucks and abstract representations are Mark’s more common themes. 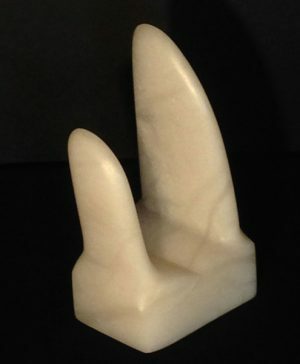 He works in a number of different stone, including alabaster from Italy (white) and the US (translucent orange and pink) and soapstone from Brazil. He has recently started carving in chlorite (black) from British Columbia. Mark Redsky’s work has been widely welcomed by galleries and collectors.